The value of field crops has increased greatly in New York over the last 5 years led by the dramatic increase in the value of grain corn (Fig. 1). The acreage of grain corn has increased significantly, averaging about 600,000 acres from 2007-2011 compared with about 470,000 acres from 2002-2006 (NYS Ag Statistics, 2011). In addition, corn yields have averaged about 138 bushels/acre from 2007-2011 compared with about 119 bushels/acre from 2002-2006. Consequently, the value of corn for grain has averaged about $400 million from 2007-2011, slightly higher than the $385 million value of vegetable production (fresh market and processing together) in New York during the same period (NYS Ag Statistics, 2011). Additionally, the value of corn silage production averaged about $300 million from 2007-2011, slightly less than the $330 million value of fruit production during the same period (NYS Ag Statistics, 2011). Therefore, because of the dramatic increase in the value of both the grain corn and silage crops, the corn crop had an average value similar to the fruit and vegetable crop values combined from 2007-2011. The value of soybean has also increased over the last 5 years although at a much lower value than corn (Fig.1). The acreage of soybean has increased significantly, averaging about 245,000 acres from 2007-2011 compared with 170,000 acres from 2002-2006 (NYS Ag Statistics, 2011). As with corn, the average soybean yield also increased, averaging 44 bushels/acre from 2007-2011 compared with 39 bushels/acre from 2002-2006 (NYS Ag Statistics, 2011). 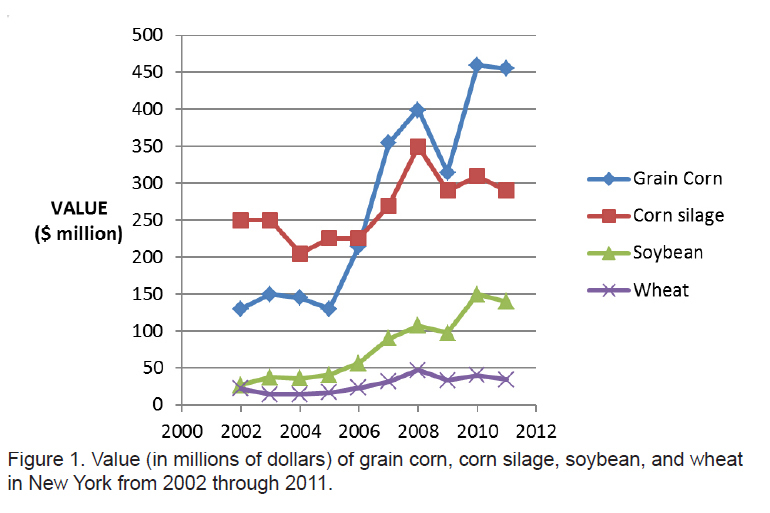 Consequently, the value of soybeans averaged about $120 million from 2007-2011 compared with $40 million from 2002-2006 (Fig.1). In contrast to corn and soybean, wheat acreage has stayed relatively constant, averaging about 115,000 acres from 2007-2011, similar to acreage from 2002-2006 (NYS Ag Statistics, 2011). The average yield, however, increased to 61 bushels/acre from 2007-2011 compared with 56 bushels/acre from 2002-2006. Consequently, the wheat crop had an average value of $35 million from 2007-2011 compared with about $18 million from 2002-2006 (Fig.1). Although the value of wheat straw cannot be quantified, it likely adds an additional $15 million in value to the crop. Likewise, it is difficult to place a value on the total forage production in New York State, which has averaged about 1.9 million acres from 2007-2011 (NYS Ag Statistics, 2011). The value of total hay (1.35 million acres from 2007-2011) averaged about $300 million from 2007-2011 compared with about $345 million from 2002-2006, one of the few field crops that has declined in value over the last 5 years (NYS Ag Statistics, 2011). The value of total field crop production has increased dramatically over the last 5 years, averaging about $1 billion in 2010 and 2011, about 40% of the value of milk production in New York State (NYS Ag Statistics, 2011). Although field crops have traditionally occupied more than 90% of the crop acreage in New York, field crops have been generally seen as solely providing support to the dairy industry. The dramatic increase in the value of corn, soybean, and wheat over the last 5 years, however, should change the traditional perception of New York field crops. For example, New York traditionally has been a feed grain (corn, soybean, oats, and barley) deficit State feeding about 2 million tons annually but producing only about 1.85 million tons annually from 2002-2006 (NYS Ag Statistics, 2011). Subsequently, feed grain from the Midwest or Canada has traditionally been shipped in to support the feed demand of dairy industry. In contrast, recent feed grain production in New York averaged about 2.7 million tons annually, whereas about 1.9 million tons have been fed annually in New York from 2007-2011. New York is now a feed surplus State and field crops are now marketed to other buyers as well as to the dairy industry. If this trend continues, NY field crops should be viewed not as an industry that solely supports the dairy industry but rather as a stand-alone industry that provides support to the dairy industry. Red clover undersown into a small grain crop is commonly used as an N source for corn in organic grain production systems. How much N should be credited to the clover green manure is unclear. In this study we addressed the following issues: (1) ammonium and nitrate dynamics over time following clover plowdown; (2) release peak for nitrate related to the above ground biomass in the clover; and (3) clover plowdown influence on the results of the Illinois Soil Nitrogen Test (ISNT), a predictor of soil N supply potential. Results from earlier years were reported in Godwin et al (2009) and Ketterings et al (2011). Here we report the 4-year summary. We monitored ISNT-N, ammonium-N and nitrate-N levels on a weekly basis in corn crops in one management system within the Cornell Organic Grain Cropping Systems Experiment at the Musgrave Research Farm near Aurora, New York. 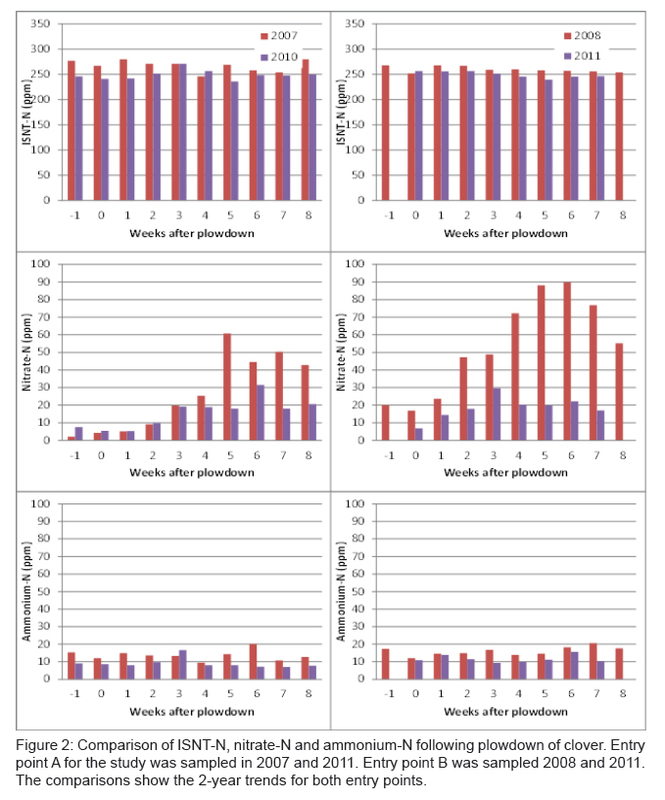 Beginning in 2005, this experiment has compared five management systems with differing fertility and tillage regimens and two entry points into a soybean-spelt/red clover-corn rotation (http://www.organic.cornell.edu/ocs/grain/index.html). For the project discussed here we sampled the Low Input Organic System (System 2) during years when corn was grown following plowdown of a 1-yr old clover cover crop. Actual fertility amendments and their date of application are shown in Table 1. Plots were randomly split into two rotation entry points, so that one half of each plot was a year behind in the crop rotation sequence. The plots that were sampled for N dynamics were part of Entry Point A in 2007 and 2010 and Entry Point B in 2008 and 2011. Prior to plowing, we collected samples of above-ground clover biomass. Below-ground biomass was also sampled in 2011. The initial soil sampling round (0-8 inch depth; 12 cores per 120’ x 40’ plot) occurred prior to plowdown of the clover. The next sampling round occurred at plowdown and was followed by eight sampling rounds at weekly intervals thereafter (seven in 2011). Corn was planted in late May or early June (Table 2). On New York organic grain farms corn is generally planted in late May with the goal of planting into warm soils to achieve optimal germination without the need for seed protectants, and to allow for sufficient clover growth to support the N needs of the corn crop. Soil samples were analyzed for ISNT-N in the Cornell Nutrient Management Spear Program (NMSP) laboratory using the enclosed griddle modification of Klapwyk and Ketterings (2005). Soil samples were also analyzed for 2 N KCl extraction of exchangeable nitrate+nitrite and ammonium as described in Mulvaney (1996). 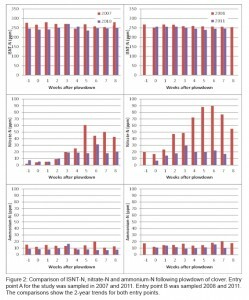 The weather patterns showed two extreme rainfall events during the sampling periods: a 2 inch plus rainfall event in week 4 after planting in 2010 and another in week 5 in 2011 (Table 3). Clover above-ground dry biomass was 1.6, 2.4, 1.5 and 1.7 ton/acre in 2007, 2008, 2010 and 2011, respectively. In 2011 the below ground cover crop biomass was 0.6 ton/acre, about 25% of the total (above and below ground) biomass of the clover cover just prior to plowdown. The year 2007 was a drought year with low corn yield (87 bu/acre), whereas 2008 and 2010 were excellent growing years (165 bu/acre in 2008 and 160 bu/acre in 2010). 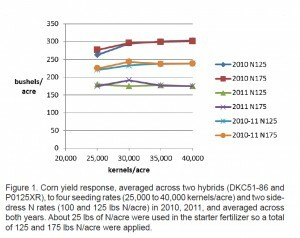 Despite challenging growing condition (wet spring and fall, dry mid-summer) yield averaged 150 bu/acre in 2011. Soil nitrate-N levels increased following clover incorporation (Figure 1). The height of the nitrate-N peak following plow-down was consistent with clover biomass over the four years: just over 60 ppm in 2007, almost 90 ppm in 2008, and about 30 ppm in 2010 and 2011 (Figure 1). Peaks in nitrate-N were measured in week 3 in 2011 and 5 or 6 in all other years. The timing of nitrate-N release from clover was well-aligned with the period of highest corn N needs in 2007 and 2008. In 2010 and 2011, the heavy rainfall in week 4 (2010) and week 5 (2011) may have leached nitrate-N. Nitrate leaching may be the cause of the relatively low nitrate release peaks in 2010 and 2011. Soil samples were analyzed for ISNT-N as an indicator of soil N supply potential through mineralization of organic matter. Previous work has shown that the test is accurate as a predictor of soil N supply potential for corn but that soil samples should not be taken within 5 weeks after manure addition or sod turnover; these amendments create a temporary increase in ammonium-N and hence also in ISNT-N. The question remained whether incorporation of a cover crop would result in a similar restriction in timing of sampling for ISNT-N. 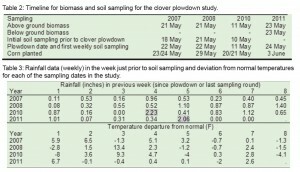 The results of the four years of testing showed that clover incorporation did not result in an accumulation of ammonium-N and hence it is also not surprising that the ISNT-N levels remained stable over time (coefficients of variation across sampling dates were only 4.3, 2.2, 3.9, and 2.6% for 2007, 2008, 2010, and 2011, respectively). These results suggest that for the clover-based system, timing of ISNT sampling is not restricted (i.e. sampling can occur before or after clover incorporation). The comparisons of ISNT-N in 2007 and 2010 (entry point A) and 2008 and 2011 (entry point B) suggest a slow decline in ISNT-N over time under current management and yield levels (Figure 2) but additional research (more data points in time) is needed to evaluate trends. Averaged across plots, the pre-sidedress nitrate test (PSNT) results were 20, 29, 16, and 17 ppm where clover had been plowed down in 2007, 2008, 2010, and 2011, respectively. There was a strong correlation between clover above-ground N pool prior to plow down and PSNT in this study (PSNT (ppm) = 4.9 + 0.14 * Npool (lb N/acre); R2 = 0.94). Additional data points are needed before conclusions can be drawn about the use of above ground N pool as a predictor of PSNT-N and the impact of weather on the predictions. 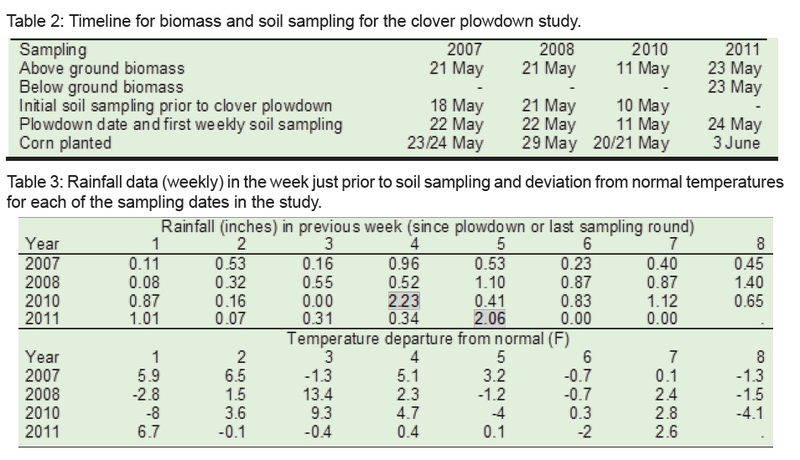 The weekly sampling and the PSNT results of the clover systems suggest that the clover supplied a considerable amount of N. Application of 1900 lb/acre of 4-5-2 poultry manure compost in addition to the plowed down clover in the same experiment showed no yield increase in 2007-2010 (Caldwell et al., 2011) or 2011 (data not yet published), suggesting that in each of the four years, the nitrate-N released from clover decomposition was sufficient to meet the needs of the corn, despite the <21 ppm PSNTs in 2007, 2010, and 2011. Clover incorporation greatly increased the amount of available N for the following corn crop. Decomposition of the clover resulted in nitrate peaks 5-6 weeks after incorporation, well-aligned with N needs of the corn and showing that clover plowdown is an excellent choice for providing N to corn in organic and conventional production systems. Clover decomposition did not result in ammonium-N accumulation. This study needs to be duplicated at other locations but results to date indicate that a clover cover crop can supply sufficient N. although actual N supply will vary depending on the biomass produced and mineralization conditions. The study also showed that ISNT sampling for assessment of soil N supply is not restricted in time where clover is a main source of N fertility. Ketterings, Q.M., G. Godwin, C.L. Mohler, B. Caldwell, and K.J. Czymmek (2011). Impact of clover incorporation and ammonium nitrate sidedressing on Illinois Soil Nitrogen Test dynamics over time 3-year summary What’s Cropping Up? 21(2): 1-4. Klapwyk, J.H., and Q.M. Ketterings (2005). Reducing laboratory variability of the Illinois soil N test with enclosed griddles. Soil Sci. Soc Am. J. 69: 1129-1134. Mulvaney, R.L. (1996). Nitrogen-Inorganic Forms. In Methods of soil analysis. Part-3- Chemical Methods. SSSA, Inc., ASA, Inc. Madison, WI. P. 1123-1184. This work was supported by the USDA Organic Research and Extension Initiative, the New York Farm Viability Institute, and funds from the Cornell Experiment Station. We thank Kreher’s Poultry Farms for donating compost. For questions about these results contact Quirine M. Ketterings at 607-255-3061 or qmk2@cornell.edu, and/or visit the Cornell Nutrient Management Spear Program website at: http://nmsp.cals.cornell.edu/. When soil conditions are conducive to a 90% plant establishment rate, we currently recommend seeding rates of 30,000 kernels/acre for grain corn on silt loam soils in New York, based on small-plot studies at the Aurora Research Farm from 2003 to 2005 and field-scale studies from 2006 through 2010 (What’s Cropping Up?, Vol. 21, No.1, p.4-5).The results from the studies in the 2000s are similar to a 1991-1993 study in which nine hybrids (released in the late 1980s or early 1990s) also had optimum yield at 30,000 kernels/acre (What’s Cropping Up?, Vol. 4, No.2, p.3). Recent hybrid releases, however, have been selected at higher plant populations and lodge less because of the Bt corn borer trait. Consequently, there is a general belief that recent hybrid releases require higher seeding rates than hybrid releases from the late 1980s and early 1990s. In addition, new hybrid releases may respond more positively to N fertilization so there is also a general belief that new hybrid releases planted at high rates with high N fertilization will “really kick it out”. Most of our studies in the 2000s were conducted at recommended side-dress N rates so perhaps that is the reason why our results do not validate the general belief that high seeding rates (~35,000 kernels/acre of higher) are required for optimum yield in NY. On the other hand, most corn seed is now treated with soil-applied insecticide/fungicide, which results in greater stand establishment today. Consequently, the higher plant establishment rate may offset the need to plant new hybrid releases at higher seeding rates. We completed a 2-year hybrid by seeding rate by side-dress N rate study (small-plot) in 2011 to determine if new hybrid releases respond more positively to higher seeding rates at higher side-dress N rates. We evaluated two hybrids with the Bt corn borer trait (DKC51-86 and P0125XR) at four seeding rates (25,000 to 40,000 kernels/acre) and two side-dress N rates (the recommended side-dress N rate of 100 lbs/acre for corn following soybeans and a high side-dress N rate of 150 lbs/acre) in small plot research at the Aurora Research Farm in 2010 and 2011. About 25 lbs of N/acre were also applied in the starter so a total of 125 and 175 lbs of N/acre was applied in this study. The planting date was 30 April in 2010 and 10 May 2011 and corn was side-dressed with the two N rates at the 4th leaf stage (V4). Plant establishment rate averaged 87% for the DEKALB hybrid and 79% for the Pioneer hybrid in 2010 and about 90% for both hybrids in 2011. When averaged across years, hybrids did not influence yield so results have been averaged across hybrids. 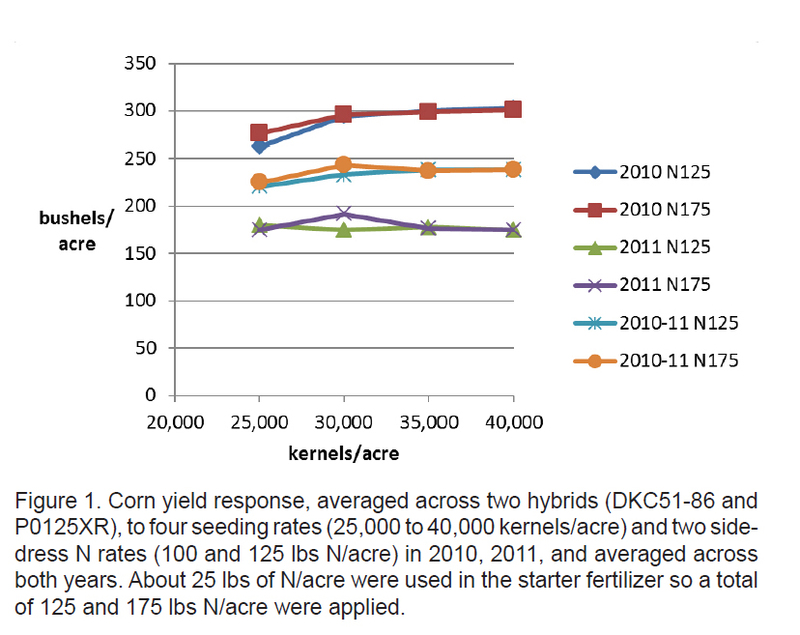 The quadratic regression equation predicted maximum yield at about 35,000 kernels/acre in 2010, a year with record yields in NY and at the experimental site (Fig.1). The quadratic equation, however, typically overestimates maximum values as evidenced by only a 1.5% yield difference between the 30,000 kernel/acre (295 bushels/acre) and the 35,000 kernel/acre seeding rate (299 bushels/acre). In 2011, a year with very dry June and July conditions, regression analyses indicated no response to seeding rate (Fig.1).When averaged across years and hybrids (Fig.1), yields were virtually the same at seeding rates of 30,0000 (239 bushels/acre), 35,000 (239 bushels/acre), and 40,000 kernels/acre (240 bushels/acre). Of equal importance, there was no difference in yield between N rates (Fig. 1). Also, there was no difference between hybrid by seeding rate by side-dress N rate interaction in either year of the study or when averaged across years (Fig.1). This indicates that optimum yields were achieved for both hybrids in both years at the 30,000 kernel/acre seeding rate at the recommended side-dress N rate when corn follows soybeans. No further yield increase was observed at the higher seeding rates in the presence of higher N rates. Once again, the recommended seeding rate of 30,000 kernels/acre resulted in close to optimum yield in a year with the highest yield on record (2010) and in a year with the second driest July on record (2011) in the presence of recommended or elevated N rates when corn follows soybeans. Nevertheless, almost all grain growers plant at higher seeding rates so we question whether this seeding rate response is consistent across different soil types and farming operations in NY. Consequently, Geoff Reeves, an MS student with our program at Cornell, initiated field-scale studies in 2011 on four farms evaluating two hybrids at four seeding rates (25,000 to 40,000 kernels/acre) in the major corn grain regions of NY. We have two studies in western NY (twin-row corn in Orleans County and 30-inch rows in Livingston County) and two studies in central NY (20-inch rows in Cayuga County and 30-inch rows in Seneca County). We evaluated stand establishment, lodging, yield, moisture, and test weights in 2011. We will collect the same data again in 2012 and Geoff will conduct a partial budget analyses to determine optimum economical seeding rates for grain corn across different soil types and farming operations in NY. 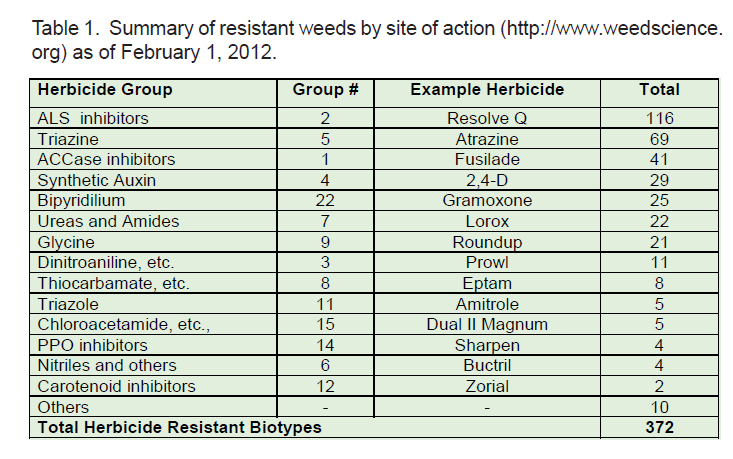 According to the International Survey of Herbicide Resistant Weeds (http://www.weedscience.org), 372 resistant weed biotypes representing 116 dicot (broadleaf) and 85 monocot (grass and sedge) species have been confirmed as herbicide resistant as of February 1, 2012. Historically, there was great concern about triazine resistant (Photosystem II inhibitors – Group 5 herbicides) weed biotypes, which now number 69 (Table 1). In recent years, concern has shifted to ALS (Acetolactate Synthase inhibitors – Group 2 herbicides) and to glyphosate (EPSP Synthase inhibitors – Group 9 herbicides) resistant weeds. In the case of ALS resistance, this heightened concern is due to the rapid increase in the number of weed biotypes (116) that are resistant to these Group 2 herbicides and due to the fact that there are numerous herbicides with this mechanism of action that are used on multiple crops. Finally, although there are only 21confirmed cases of glyphosate resistant weeds, the widespread adoption of glyphosate resistant crops and the increased used of glyphosate herbicide has placed a spotlight on weed populations resistant to this mechanism of action. 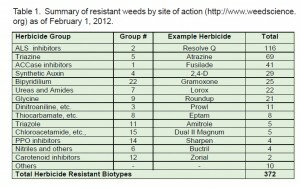 Lesson 1 – Current Status of Herbicide Resistance in Weeds, helps understand the need for herbicide resistance management and provides information on the status of herbicide resistance by mechanism of action, on the increase in weeds with resistance to multiple mechanisms of action, and on the global distribution of herbicide resistance. Lesson 2 – How Herbicides Work, provides information on terminology associated with herbicide use along with an understanding of how herbicides are grouped according to their mechanism of action. Lesson 3 – What is Herbicide Resistance? A definition of herbicide resistance, an understanding of the different types of resistance, and information on how resistant weed populations develop are included in this lesson. Lesson 4 – Scouting After a Herbicide Application and Confirming Herbicide Resistance, provides information on the importance of scouting for herbicide resistant weeds, on reasons why weeds can be present after herbicide application, on knowing how to identify herbicide resistance in the field, and on procedures for confirming resistance in the field or greenhouse. Lesson 5 – Principles of Managing Herbicide Resistance, provides an understanding that diversity is an important concept in resistance management, identifies broad strategies and specific tactics for managing herbicide resistance, and compares the value of proactive and reactive management practices. Although New York State has been fortunate to have limited problems with herbicide resistant weeds, these lessons provide an in-depth understanding of this growing problem and information on how farmers can avoid or deal with herbicide resistance. Initial studies at a Western New York State dairy farm showed that for corn fields with a recent manure history, starter nitrogen (N) fertilizer could be eliminated without losing yield or reducing forage quality. Eliminating starter N on corn fields with a manure history has the potential to deliver significant savings of time and money to dairy producers. In 2009, we initiated a 3-yr project to test the need for starter N fertilizer across a range of New York State soil types and growing conditions. The objective of this study was to assess differences in yield and forage quality between corn that receives starter N fertilizer and corn that does not, on fields with varying manure history. Here we report the 3-year summary for sites completed without external challenges (weed control, bird damage, planter issues, harvest challenges, etc.). The final dataset included 21 trials, distributed throughout New York State. Each trial included four replications or more of two treatments: 30 lbs N/acre in the starter versus no N in the starter. In 2009, seven trials were completed, including three trials at commercial farms and four at the Aurora Research Farm (sites 1 through 7). In 2010, starter N response trials were established at ten commercial farm locations and repeated at the Aurora Research Farm (sites 8–21). In 2011, an additional seven sites were established on commercial farms. Across all trial years, a total of seven trials were lost due to planter issues, excessive moisture interfering with planting and/or harvest, bird or deer damage, weed pressure, excessive variability, or uncertainty about the actual treatment allocation. All other trials (21 sites) are included in this summary. Eleven sites had an ISNT-N level classified as “deficient in soil N supply potential” (>7% below the critical value), five sites were “marginal in soil N supply potential” (within 7% of the critical value) while five sites were “optimal in soil N supply potential” (ISNT-N >7% above the critical value). Across all three years, of the fields with optimal soil N supply potential (sites 19, 20, 21, 23, and 25), the manure application alone was sufficient to meet the N needs of the crop; none of these three locations showed a yield increase with starter N use (Table 1). The CSNTs (Table 2) confirmed N was not limiting yield at these sites, and for two locations (20 and 21) showed sidedress application rates can be reduced if not eliminated. Used in this way, the data suggest that the ISNT can help identify fields that will not benefit from starter or sidedress N.
Of the five sites that were classified by the ISNT as marginal in soil N supply potential, all received manure and only one (site 31) responded to starter N. The CSNTs were classified as optimal (sites 13, 31, and 35) or excess (sites 3 and 14), indicating that the fields received sufficient or more than sufficient N (Table 2). However, the lowest CSNT was measured for the site that had the yield response to starter N, suggesting an adjustment in CSNT interpretation is needed (inclusion of a 250–750 ppm “Marginal” range). We conclude for these five locations that manure application can replace starter and sidedress N for soils with a marginal soil N supply potential, as long as sufficient N is added with the manure. The results of site 31 also suggest that in some years a response to N can be expected where CSNTs are <750 ppm. The sites classified as deficient in soil N supply potential (i.e., soil N alone is not expected to supply sufficient N for the corn crop that year) included the trials at Aurora with either no manure history (sites 6 and 11), or with limited manure history (sites 4, 5, 7 in 2009, and 9, 10, 12 in 2010) plus three on-farm locations (sites 8, 15, and 16). 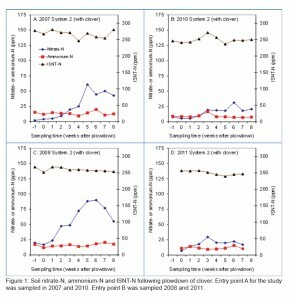 The results at sites 6 and 11 (significantly higher yields in 2010 with starter N and a similar though not statistically significant trend in 2009) suggest that starter N is needed for fields that do not have an optimal soil N supply as measured by the ISNT and are managed without manure. The results at site 11 also suggest that a response to N can be expected if CSNTs are <750 ppm (high producing year on deficient ISNT soil), consistent with the results of site 31. At the other 3 sites at the Aurora Research Farm (4, 5, 7 in 2009; 9, 10, 12 in 2010), liquid manure had been applied at a rate of ~8,000 gallons/year over the past 5 to 6 years. Manure application increased ISNTs over time (compare values to sites 6 and 11), but after 5 to 6 years of manure application, the ISNT of these sites was still classified as deficient. Of these six site*years, three showed a significant yield increase with starter N addition, while a similar trend was seen for the other three sites (Table 1). These same sites exhibited deficient CSNTs (Table 2), suggesting that the specific manure history was not enough to increase soil N supply to levels high enough to supply the N needed by the crop and that the current year manure applications were also insufficient to meet N needs of the crop. Under these conditions, the starter N application was needed. Of the remaining three on-farm sites with low soil N supply potential, two sites had CSNTs in the optimal range (without starter). A lack of a yield response to starter N illustrated that for these locations, the current year manure supplied sufficient N and starter N was not needed. The very high CSNT of site 15 >5000 ppm) suggests a reduction in sidedress N application was possible without an impact on yield or quality. Of the silage trials, two locations showed a significant increase in crude protein with starter N addition (sites 3 and 21) while at one site, crude protein declined with starter N addition (site 25). Soluble protein increased at two locations, although the difference was very small (an increase of 0.3 and 0.1% in soluble protein at sites 3 and 16, respectively) and decreased at one site (site 25). Only one site showed a change in NDF (decrease, site 21). 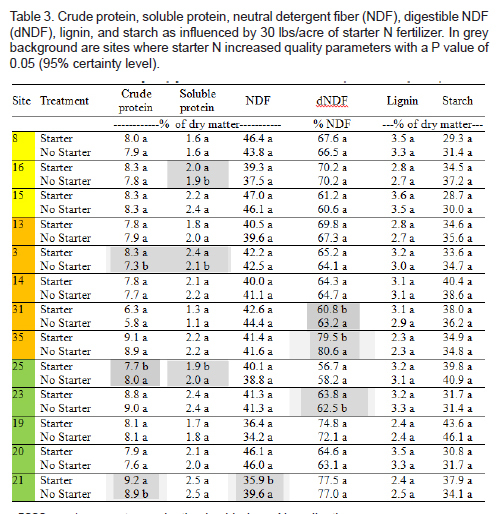 At one site, NDF digestibility increased with starter N addition (site 23) while at two additional sites, NDF decreased with starter N addition (sites 31 and 35). Lignin and starch were not impacted at any of the silage trials. Elimination of starter N did not result in significant differences in milk per acre estimates except for at one site where starter use decreased milk per ton (site 25, results not shown). Milk-per-acre estimates were only impacted at one site (increase at site 31, consistent with the yield increase upon starter N use). Sites 6 and 11 (the only deficient ISNT sites without a manure history) illustrate that starter N will be needed even if sidedress N is applied. This scenario applies to cash grain operations without manure histories. Under those conditions, the best management practice is to use starter N (20-30 lbs N/acre) and sidedress to meet crop N needs. 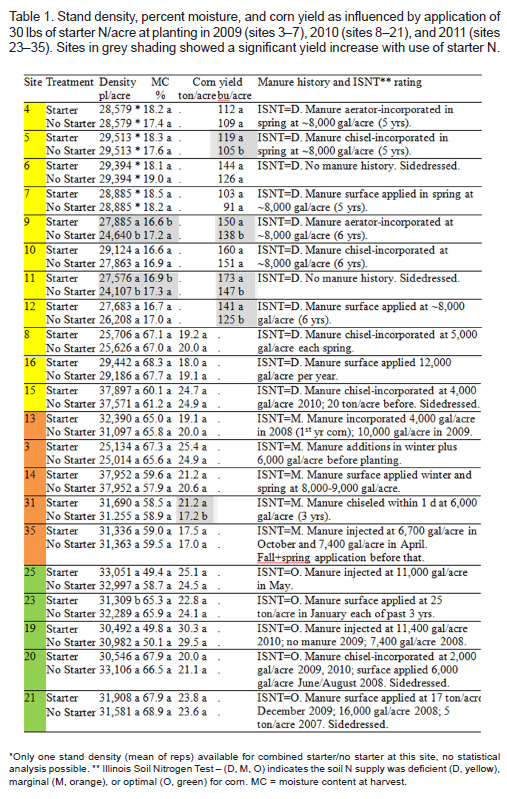 Omission of starter N is not recommended for fields without a manure history (deficient ISNT-N). Sites that were classified as sufficient in ISNT-N included sites 19–25 (5 sites). None of these five sites showed a yield response to starter N addition. We conclude that if the ISNT is classified as sufficient, manure can be used to replace starter N.
Manured sites that were sidedressed (sites 15, 20, 21, 25, and 35) all had CSNTs that were optimal or excessive. Starter N use did not increase yield at any of these locations. Optimal or excessive CSNTs at each of these five locations suggest that sidedress N could have been eliminated or application rates reduced at these locations. These results suggest that starter N can be omitted for sites with a manure history even if the ISNT is deficient or marginal, as long as sufficient N from manure and other sources (rotations, soil N, sidedress N) is available. Sites that had a manure history but were classified as deficient in N based on the CSNT included sites 4–5, 7, 9–10 and 12 (6 sites). Of these sites (all Aurora Research Farm sites with some but limited manure application history), sites 5, 9, and 12 showed higher yields when starter N had been applied than where corn was planted without a starter, with similar trends at sites 4, 7, and 10 (all Aurora Research Farm sites). The ISNT for each of these Aurora Research Farm sites was classified as deficient, suggesting additional N was needed. 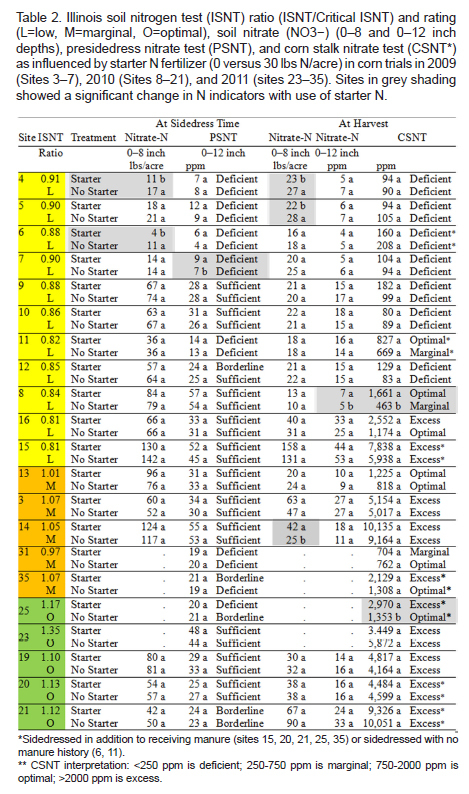 These results indicate a response to starter N is likely if ISNT-N is deficient and additional N applied is insufficient. The tool available to determine whether or not the overall N addition was sufficient is the CSNT. The yield results of sites 11 and 31 (locations with an average CSNT between 250 and 750 ppm plus a significant yield difference upon use of starter N), suggest that a new interpretation should be added for 2nd or higher year corn: “Marginal” (250–750 ppm), where a response to starter N could be expected in wet years. Starter N should be used for fields with no manure history and no current year manure applications (deficient ISNT-N). If the ISNT-N is classified as optimal, manure can be used to replace starter N without a yield or quality decline. Manure can replace starter N for sites deficient or marginal in ISNT-N as well, but only if sufficient N from manure and other sources (cover crops, soil N, sidedress N) is available (CSNTs between 750 and 2000 ppm); a yield response to starter N would have been likely if the ISNT-N was deficient and additional N applied was insufficient as well. A new interpretation should be added for the CSNT for 2nd or higher year corn: “Marginal” (250–750 ppm), where a response to starter N could be expected in some years. To reduce risk, it is recommended that farms strive for CSNTs between 750 and 2000 ppm, using 8-inch stalks taken between 6 and 14 inches above the ground. We recommend producers analyze 2nd or higher year corn fields for both ISNT-N and CSNT, to identify sites where a starter N application can be omitted. A policy interest in regional nutrient balances and farm interests in the value of manure inspired a study to begin understanding and characterizing the current state of manure exports and imports in New York State (NYS). Initial discussions with producers, farm advisors, and policy makers showed a need for more information on (1) the current movement of manure between dairy and crop farms, and (2) the (perceived) value and costs of manure handling for both dairy and crop farmers. The purpose of this study was to obtain information about current manure use, transfers, drivers and limitations, and the value of manure as perceived by crop and dairy producers. Figure 1. Postcard style surveys were handed out to dairy and crop producers in the winter of 2010.
completed (200 dairy and 66 crop producers) representing 38 NY counties, and 7 counties from Vermont, Connecticut and Maine. Among those surveyed, the average dairy farm had 295 cows with 625 acres of cropland. The average crop farm was 1030 acres. Across dairy farms, 86% of the acreage received manure (535 acres out of 625 acres of the average dairy farm), 47% had at least 6 months of manure storage. All of the farms with 700 or more cows (17 farms) tested manure at least annually versus 40 of 53 farms (75%) for farms with 200-699 cows. At farms with 100-199 cows, manure was tested annually by 10 of 34 farms (29%) and once every 2-3 years by 17 of 34 farms (50%). 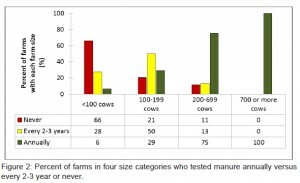 Of the farms with less than 100 animals, 66% never tested manure for nutrient content (Figure 2). Manure was exported off the farm by 20% of the 200 dairy producers that were surveyed. 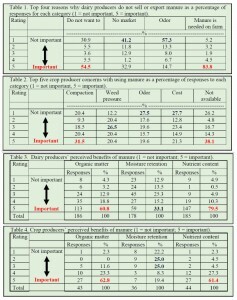 The most important reason for not exporting (more) manure was the perceived lack of manure to meet crop nutrient needs at the dairy farm itself (Table 1). Of the crop producers surveyed, 64% reported that they apply manure to an average of 41% of their crop acres, indicating manure export from dairy farms to crop farms is occurring in the region. 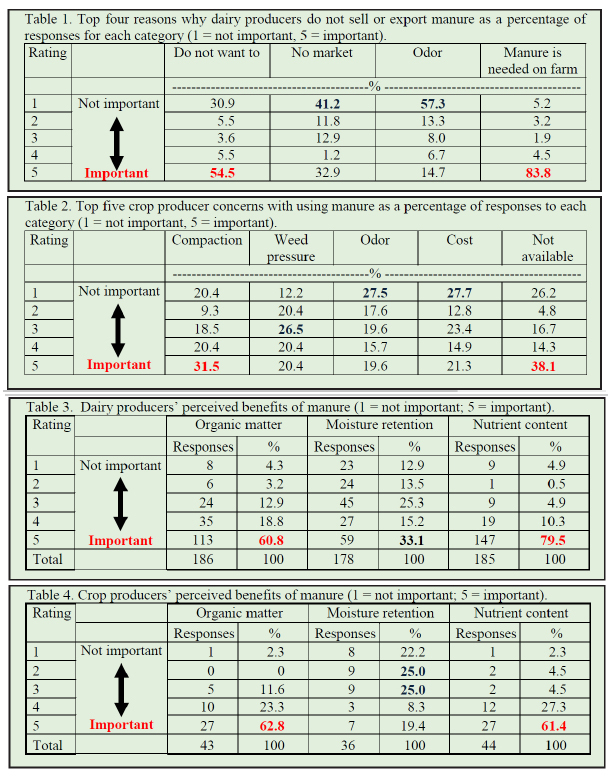 Crop producers who did not import manure indicated lack of availability and concerns about compaction as the two main reasons to limit manure use on their farm (Table 2). Odor and costs were seen as less of a concern. Both dairy and crop producers listed organic matter and nutrients as the most valuable manure properties (Tables 3 and 4). Enhanced soil water holding capacity (moisture retention) with manure use was considered less important. producers on average priced manure at a value of $96 per acre with a range of $20 to $400 per acre while crop producers on average valued manure at $53 per acre with a range of $0 to $150 per acre, respectively. Of those crop farmers that applied manure, only 21% indicated they had paid for the manure. The average payment per acre manure applied was $88/acre. Dairy producers estimated their actual manure handling and application costs to amount to $43/acre (averaged across the farms). Manure nutrient distribution to non-dairy cropland is taking place in the region. 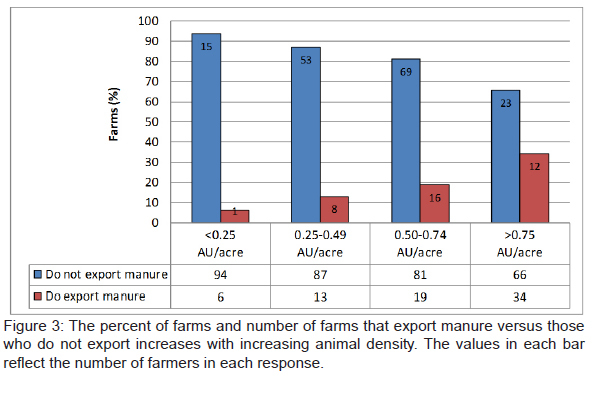 However, many of the dairy farms (160 out of 197) did not export manure (Figure 3). 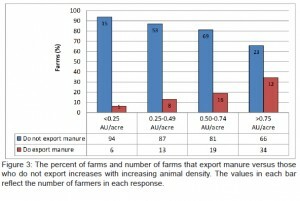 The percentage of farms that export manure increases with an increase in animal density with a third of the farms exporting manure when animal densities exceeded 0.75 animal units per acre (1 animal unit equals 1000 lbs). The survey results indicate crop and dairy producers value manure, mostly for its supply of nutrients and organic matter. Crop producers tended to place a lower monetary value on manure than dairy farmers which may reflect a deeper understanding by dairy farmers of the value of manure as a fertilizer replacement. The results of this survey reflect that manure export/import activities are currently limited by manure availability and a gap between the perceived dollar value of manure by dairy producers and by crop producers. However, the responses also indicate the potential for greater export from higher density dairy farms to crop farms in the future, as both groups share recognition of the benefits of manure. This work was sponsored by the Center for Dairy Excellence and the New York Farm Viability Institute. We thank the many Cornell Cooperative Extension educators who helped with the surveys. Questions about this project? Contact: Quirine M. Ketterings at 607-255-3061 or qmk2@cornell.edu, and/or visit the Nutrient Management Spear Program website at: http://nmsp.cals.cornell.edu/.